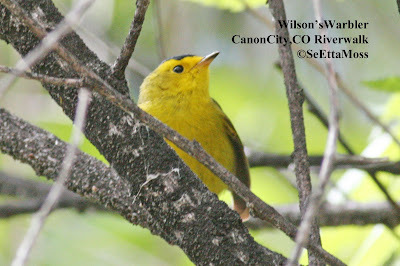 Yesterday I found several Wilson's Warblers, including the one in this pic, on the Canon City Riverwalk. These bright yellow beauties migrate through the lower elevations of Colorado on their way to their high elevation breeding areas. 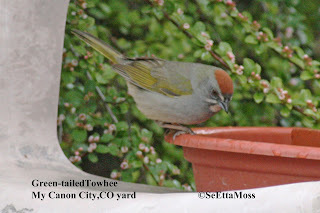 Yesterday brought 3 consecutive surprises in my yard-and all within 10 minutes in mid-afternoon. I spotted the first surprise, a Brown Thrasher, on the ground between my feeders and the water tray. Not only have I never seen a Brown Thrasher in my yard, I also have never seen one in Canon City where I live or even in Fremont County--this species is a rarity here. When I went out to try to photograph it, I spotted a MacGillivray's Warbler flitting through some shrubs near my feeders. 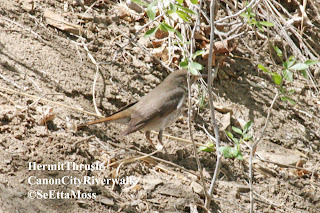 I certainly see them on the Canon City Riverwalk and had seen several there yesterday morning but my yard is a bit (not far) off the riparian pathway and in a residential area which would not seem attractive to this species nicely described by All About Birds as a "furtive bird of forest edges and thickets." 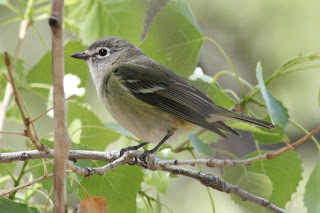 I found this vireo on the Canon City Riverwalk yesterday and I believe it is a Cassin's, which is a rarity in this area. The top two pics show a lighter shade of gray on the head with an more indistinct margin between the auriculars and the neck area which is consistent with Cassin's Vireo. 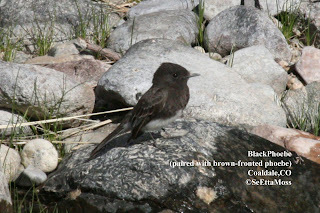 These pics are also consistent with a drab adult described in The Sibley Guide to Birds with greenish coloration to the secondaries (note: in order to preserve the coloration and shading, the only editing I have done on these pics is to crop them). 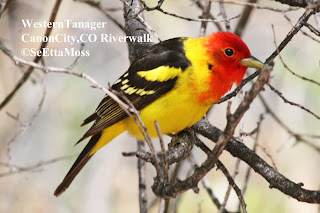 Yesterday the Western Tanagers arrived on the Canon City Riverwalk including this show-off. 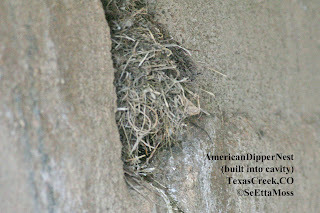 I saw several males yesterday, a couple today plus several females today. 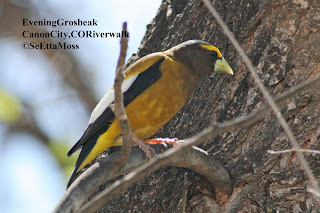 Evening Grosbeak like the one in the top pic have irrupted around the Canon City area for the past several weeks. 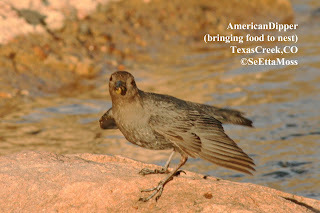 I found this one at the Canon City Riverwalk but also have them now at my feeders. 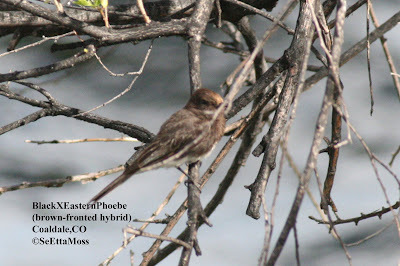 Yellow-rumped Warblers like in the other pics have been present on the Canon City Riverwalk and other riparian areas in good numbers over the past 2 weeks.